Deyo JE., et al. (1998) DNA Cell Biol. 17(5):437-47. Oh JJ., et al. (1999) Nucleic Acids Res. 27(20):4008-17. Western blot analysis of DENR over-expressed 293 cell line, cotransfected with DENR Validated Chimera RNAi ( Cat # H00008562-R01V ) (Lane 2) or non-transfected control (Lane 1). Blot probed with DENR monoclonal antibody (M01), clone 1H3 (Cat # H00008562-M01 ). GAPDH ( 36.1 kDa ) used as specificity and loading control. Western Blot analysis of DENR expression in transfected 293T cell line by DENR monoclonal antibody (M01), clone 1H3.Lane 1: DENR transfected lysate(22.092 KDa).Lane 2: Non-transfected lysate. 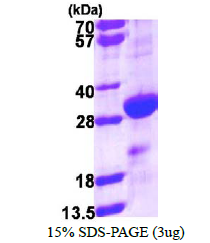 Western Blot analysis of DENR expression in transfected 293T cell line (H00008562-T01) by DENR MaxPab polyclonal antibody.Lane 1: DENR transfected lysate(21.78 KDa).Lane 2: Non-transfected lysate. Western Blot analysis of DENR expression in transfected 293T cell line (H00008562-T01) by DENR MaxPab polyclonal antibody.Lane 1: DENR transfected lysate(22.10 KDa).Lane 2: Non-transfected lysate. 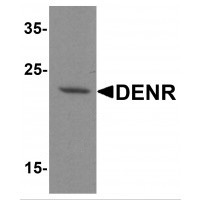 Western blot analysis of DENR in human brain tissue lysate with DENR antibody at 1 ug/mL. 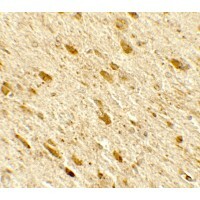 Immunohistochemistry of DENR in rat brain tissue with DENR antibody at 5 ug/mL. 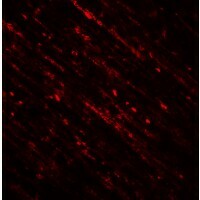 Immunofluorescence of DENR in rat brain tissue with DENR antibody at 20 ug/mL.